Though visible from the road, the classic white Colonial sits beyond a white fence, and is lush with gardens and patios that make you feel like you’ve entered a peaceful, secluded space, away from the busyness of the world. An elegant lamppost, dressed in an evergreen garland and red bow, greets you as you walk the brick pathway leading to the entrance. 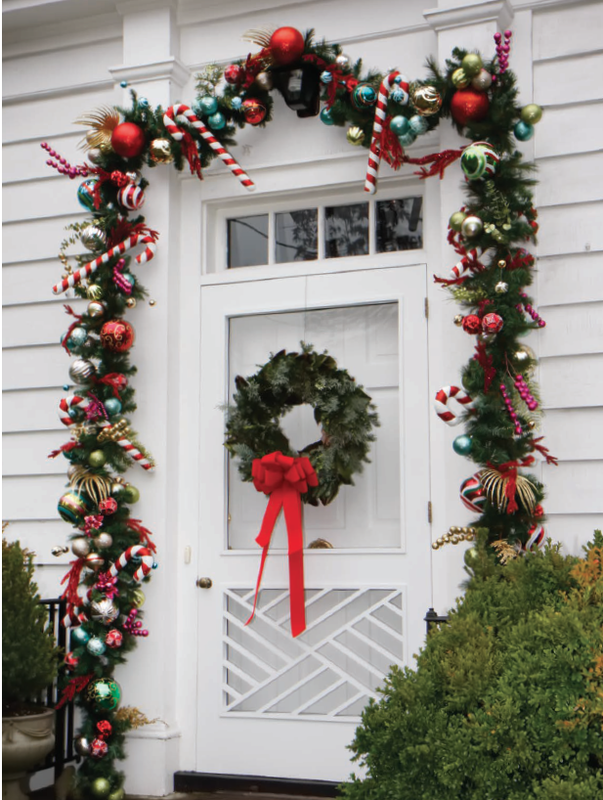 A classic wreath of greenery outfits the white Chippendale door, framed by a giant swag that houses colorful balls, sprays of gold and hot pink, and large candy canes strewn throughout. “My daughter-in-law helped me put that together,” Doris Peery explains. This joy-filled and whimsical adornment sets the stage for the rest of the Peerys’ cheerful holiday decor. It’s no surprise that even the first signs of the holidays have a story behind them, for in the Peery home, each bit of Christmas contains memories and family history. The Peerys have lived at 1020 VES Road for nearly 30 years, and raised their three children here. Jim is a dentist with a thriving practice in Lynchburg and Doris is a realtor with John Stewart Walker. The Peerys have three sons: Jonathan, who now lives in the Annapolis, Maryland area with his wife Carrie and their three boys; James, who practices dentistry alongside his father in Lynchburg; and son Hadyn, who lives with his wife and daughter in Jackson Hole, Wyoming. The happy yellow walls of the foyer warm visitors who delight at the parade of Santas perched upon the leopard-printed steps of the staircase, whose railing shines in greenery and gold. These are the first of many St. Nicks waiting to welcome guests. The Peerys’ foyer is also home to the traditional family Christmas tree—the first tree of many. This tree holds all of their children’s and grandchildren’s trinkets, lovingly handcrafted over the years. “I just have to have their ornaments on the tree, and they still want colored lights on it to this day,” Doris explains. Branches hold construction-paper Rudolphs, stitched stockings, angels created from cardboard and school pictures, and plenty of baubles to fill out the spaces. Doris and Jim maintain their family tradition of purchasing a real tree each year, and have learned a hard lesson about real trees along the way. “Never trust a tree stand, and never have the tree untethered. We tether ours twice now,” Doris says. She says that a few years ago, she caught sight of the tree falling over, and dove in front of it as it was crashing down—an effort to save her ornaments. Sadly, many of the ornaments broke during that crash. “The tree stand claims to be infallible. Try again. It was a heartbreaker, just a real heartbreaker. I don’t like my memories to be lost,” she laments. To the right of the foyer is a den with wallpaper in a classic toile design. Printed in pink, blue and green on a cream background, it ties together the rest of the room’s furnishings, which include comfortable sofas, a television, and oil paintings depicting floral still-lifes and family portraits. Doris’ collection of Santas continues on an end table. The collection started with a Santa that came from her mother. “My mother taught school, and a student gave her a Santa during her first year of teaching, and it was always in our home,” she says. The den leads into the kitchen, a decidedly sunny room with yellow tone-on-tone stripes and large windows dressed in small green wreaths overlooking the backyard, adorned with Roman shades in blue and yellow toile. 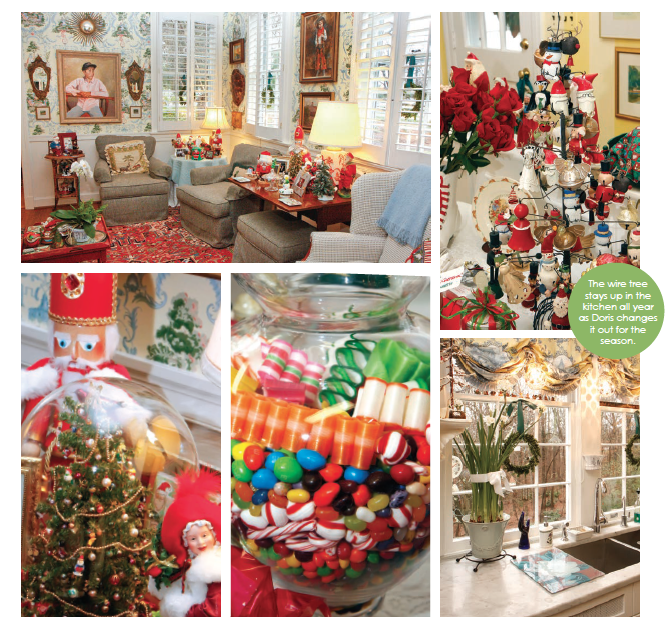 The kitchen has its own special holiday treatments, including an oversized pedestal apothecary jar filled with holiday treats for the grandchildren and a small wire tree featuring bells that were turned into snowmen, wooden soldiers, and you guessed it—more Santas. The tree stays up all year as Doris changes it out for the season. “I do birds in the winter, pirates for spring, and a beach tree for the summer,” she says. Stepping out of the kitchen leads to the former family room, which the Peerys recently transformed into a dining room. “Now it’s just the two of us, and we didn’t need all that space [in the family room.] 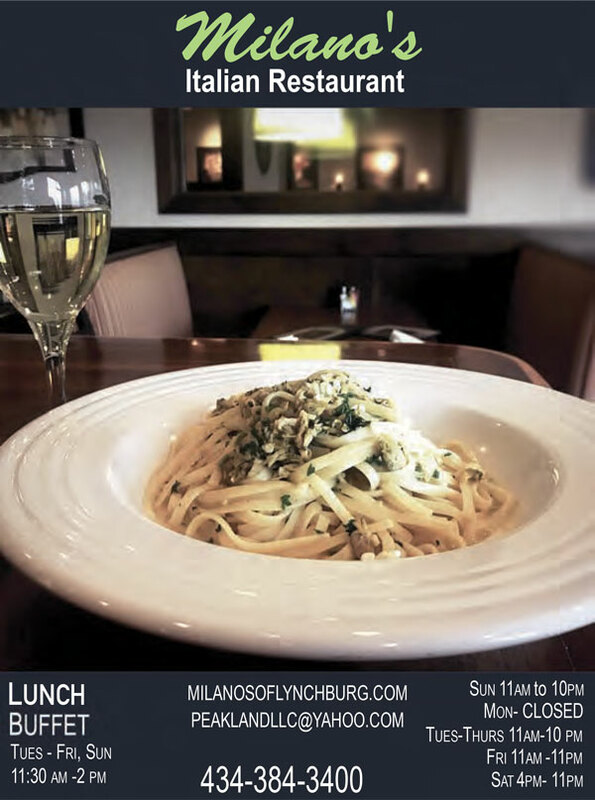 And there are enough leaves to the table to comfortably seat 12,” she says. Since Doris and Jim love to host family dinners and throw parties during the holiday season, they needed more room for entertaining. With that in mind, the Peerys repurposed the space, calling on the talents of Allan Howerton from Custom Crafters Construction, who specializes in older homes. Howerton custom-made the black mirrored glass doors for the room’s entrance and closets that serve as hidden storage, which were specially designed for the space. You wouldn’t even notice the shelving units as closets from their clever and stylish design. “This is my favorite closet in the whole house!” Doris exclaims. The new dining room explores the home’s blue and yellow color scheme, painted a fresh deep-sea blue with touches of golden buttercream. Soft yellow drapes and gold-framed mirrors contribute to the palette. Beneath one such mirror on the far end of the room, surrounded by heralding angels, dwells a miniature tree made of gumdrops that’s entirely edible. “My husband puts that together for the children; he does it every year,” Doris confesses (after all, Jim is a dentist!). Clearly, the Peery family knows and understands that holiday decorations and treats are sweet treasures. 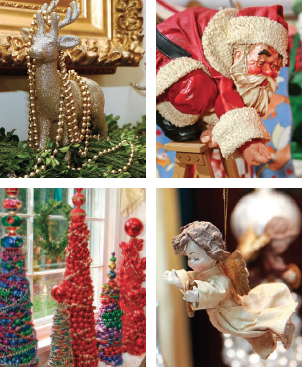 At Christmastime, Doris always keeps a row of white poinsettias in a pristine silver planter in front of the fireplace, and a mantel garland of decorative angels dangles above the flowers. Doris has a love for angels, and her assortment spans the globe. She says that some are from France, Italy, and Bequia in the West Indies, along with others that are gifts from friends. Doris places these special cherubs on a tabletop tree, while a host of six flying angels suspended from the chandelier floats above a forest of handmade trees that serve as both the table’s centerpiece and holiday focal point. 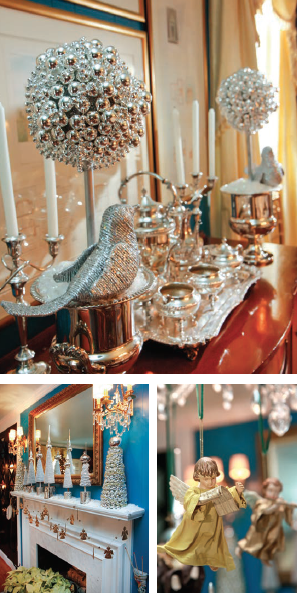 Made of Styrofoam cones, glass ornaments and glass garlands, Doris’ silver trees dot the landscape of the table, the buffet and the mantelpiece. Doris’ friend Cindy Warren made the first two for their Garden Club Christmas parties, and Doris fell in love with the look and began making them herself. When not in use, she stores them upright in special dry-cleaning bags in a temperature-controlled room. A quick walk back through the kitchen, den and foyer leads into a lively living room, where pale buttercream walls and matching drapes provide the perfect backdrop for the room’s furnishings. An eclectic mix, the Oriental rug, marble-top coffee table, and floral seating come together beautifully. The white built-in bookcases that house novels, pictures and ginger jars flank windows that highlight more of Doris’ handmade glass trees. Unlike the dining room trees, these appear in fun colors like lime green, turquoise and hot pink. 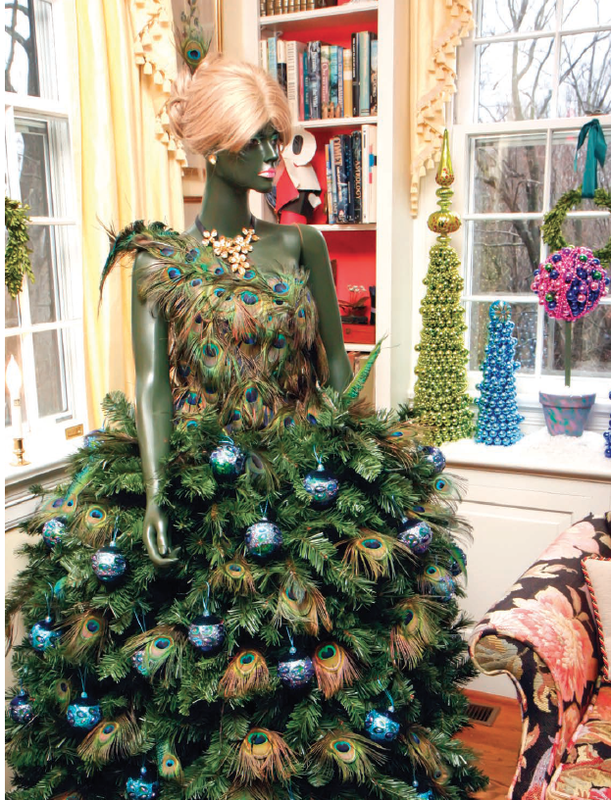 The showstopper of the room, however, is Doris’ one-of-a-kind mannequin tree. Doris saw a picture of a mannequin tree in a magazine several years ago, and decided she wanted to make one. “A friend and I bought the mannequin for Garden Day several years ago,” she says, noting that the mannequin was also used in the Giles’ home on Peakland Place for Garden Day in April 2016. “My friend and co-owner, Kay Van Allen, named her Gloriosa. Turning her into a Christmas tree was a community effort,” says Doris. She built a base of chicken wire to hold a “skirt” of Christmas tree branches and trimmings, and purchased an inexpensive tree and took it to Virginia Garden Supply “to cut the branches that were too thick for regular wire cutters.” Doris constructed the bodice from peacock feathers that she obtained from a friend of a friend’s peacock farm, and found ornaments at Big Lots in peacock blue. “I saw them and it looked like they were just designed to go on my tree,” she says. Her daughter-in-law helped her with the “tree’s” hair and makeup, and together they placed the final additions: a blonde wig tied into a chignon, hot-glued dollar store earrings and a necklace. 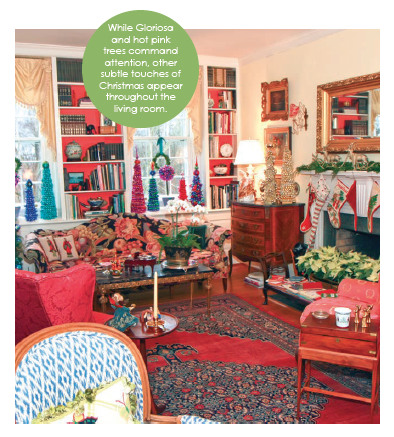 While Gloriosa and hot pink trees command attention, other subtle touches of Christmas appear throughout the room. Doris seeks out miniature creches from her travels, and nativities from France, Italy and Guatemala find holiday homes everywhere from side tables to the ledge of a hutch, and otherwise quiet corners of the living room. To the left of the living room and two steps down lies a sunroom. The white clapboard hints at the space’s original use as an outdoor porch. Years ago, the Peerys enlisted the help of Howerton to close the space in. The large windowpanes offer spectacular views into Doris’ gardens; during a particularly warm Christmas season, you can see the camellia blossoms open right before your eyes. A small boxwood tree dressed in star-shaped lights hints at the boxwoods outdoors. 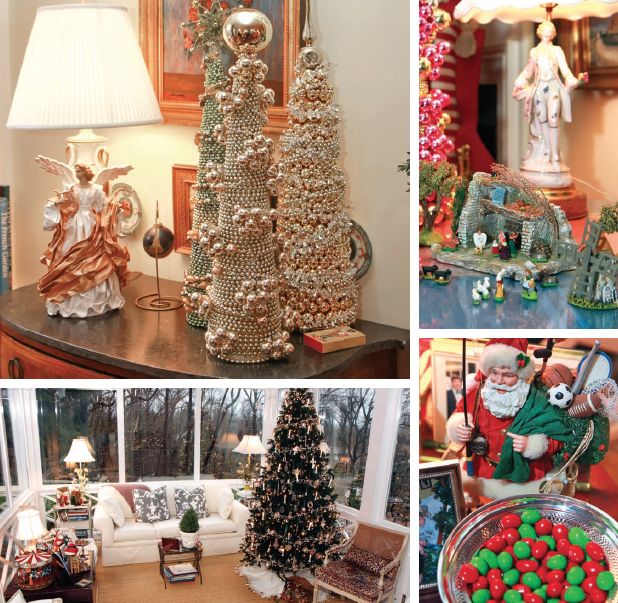 On Christmas morning, the family gathers here to open presents by the memory tree, which Doris outfits in Waterford crystal, glass beaded garlands, and special Christmas lights that look like candelabra. “We received a Waterford ornament as a wedding present, and Jim had a silver disk engraved with the year placed on it after the wedding—we’ve done that since. They all have a silver charm, so every one reminds you of what happened that year. The crystals serve as mementos of family trips, starting new jobs, graduations, and new babies.